A trip into the zone has Lori Beth Adams on the road to the LPGA Tour. 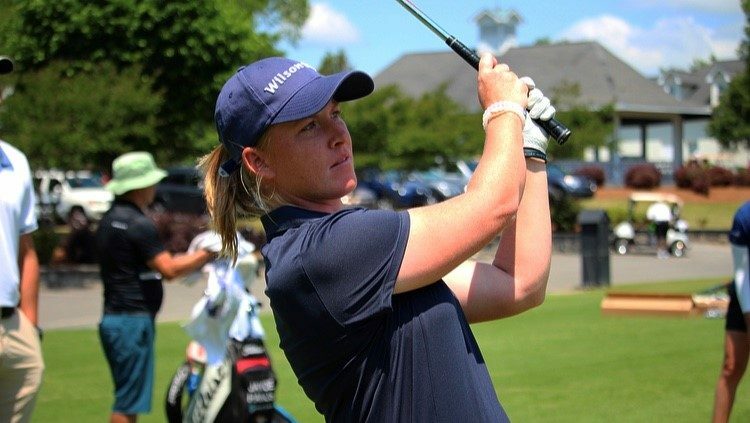 The former Western Alamance High School and UNC Wilmington star used an incredible 6-under-par 30 on the back nine of round seven in the LPGA Q-Series as the key to earning full status on the 2019 LPGA Tour. She was three shots off the magic number before the round and finished three shots to the good. The 30 capped a 65 on the memorable early November afternoon at Pinehurst No. 7 and she closed the deal with a 75 the following day. Adams secured a tie for 33rd in the event where only the top 45 passed the grade. The 144-hole marathon included four rounds at Pinehurst No. 6 in late October and another four rounds at No. 7. She posted 73-73-75-76 in the opening segment and started with 74-72 after switching courses. Then came round seven. Two early birdies provided an encouraging start but she bogeyed the par-3 ninth. There were no more bogeys and the birdies came in bunches – 10, 11, 13, 15 and 16. After a par at No. 17, she drove into the fairway bunker on the par-5 18th. Adams turned pro in 2016 and played in a few Symetra Tour events before going full time on the LPGA’s developmental circuit in 2017 with limited success. It all came together in 2018 as she posted four top-10 finishes, highlighted by a tie for second in a June tournament a then a tie for third in the Tour Championship in early October. In all, she made 14 cuts in 18 events and earned $47,597 to place 15th on the money list. She ended about $13,000 short of the top-10, which would have earned a LPGA Tour card without having to go through the Q-Series. In 51 Symetra rounds, she posted 15 scores in the 60s with a low of 65 and an average of 71.4. The LPGA Tour – with an ever-expanding international slate – hasn’t released its 2019 dates yet but it begins with the limited field Tournament of Champions Jan. 17-20 in Florida. The rest of schedule is still being ironed out, but Adams plans to be there when the first opportunity is available. Former High Point resident Drew Weaver was the only Triad area player to advance to the finals of the web.com Tour Q-School finals. Weaver, who has been chasing the dream since graduating from Virginia Tech in 2009, spent the year playing on the GPro Tour, mostly in his native North Carolina, and the McKenzie Tour-Canada. He had two third-place finishes up north and won just over $30,000 in six events. But the goal is to claim full status on the web.com Tour and Weaver put himself in position by shooting 68-71-69-69 for an eighth-place tie in the second stage event Nov. 6-9 at TPC Craig Ranch in McKinney, Texas. He’ll next tee it up at the Q-School finals Dec. 6-9 in Chandler, Ariz. Meanwhile, the second stage became the end of the road for Ryan Sullivan of Winston-Salem, William Register of Burlington, Salisbury native Will Collins and Winston-Salem native David Mathis. It was especially heartbreaking for Collins, who fell one shot short of advancing. Bruce Woodall of Yanceyville and Adam Webb of Ridgeway, Va., who made it to the Q-School finals in 2017, were eliminated in the first stage this year.